The new Tula Explore baby carrier is a versatile, easy-to-use carrier that allows you to carry the baby in an ergonomic forward facing position. This is the first baby carrier by Baby Tula that offers all the features you and baby need: variable width settings for use with newborns to toddlers, adjustable head support, and multiple carry positions including front facing and back carries. The new Tula Explore carrier combines the best features so well loved of the Tula (good fit and comfort for both moms and babes) with the new front-facing feature. Be transported to a magical place when you cuddle in Dreamy Skies. 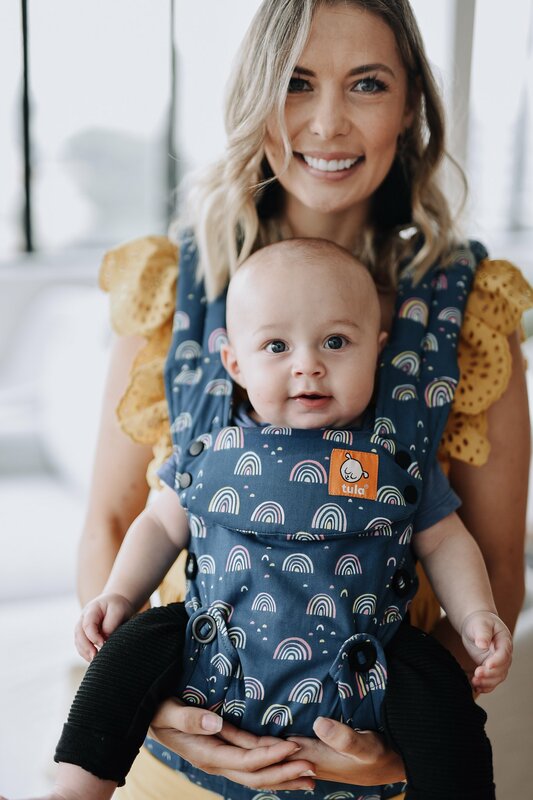 Dreamy Skies has an all-over design of pastel-colored rainbows floating across a cloudy blue backdrop that gives this Tula Carrier playful energy. The print continues onto the inner and outer carrier panel, straps, waistband, and detachable hood. Padded shoulder straps provide optimal neck & shoulder comfort and offer quick adjustments for multiple wearers. Wide padded waistband helps evenly distribute weight. Padded leg openings to keep baby comfortable..
* Before beginning to use the Explore Carrier in the facing out position, your baby should have head and neck control and their chin should clear the top of the panel when facing out. We also suggest a weight range for the facing out the position of 13-22lb for shorter intervals of time for optimal comfort. Watch the baby for signs of sleepiness or over-stimulation. Baby should not sleep in the front carry facing out position. New Explore Baby Carriers by Baby TulaFrom Newborn to ToddlerThe new Tula Explore baby carrier is a ..